The Fellowship was fortunate enough to obtain a copy of CLASSIC POPEYE #20 from IDW Publishing and Yoe Books. The stories are written and drawn by Bud Sagendorf. 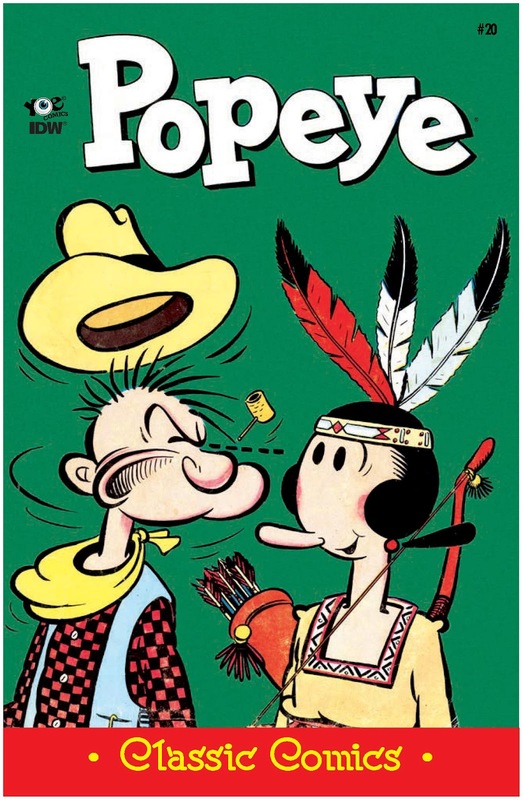 This issue was originally printed as POPEYE #20, April-June 1952. In “Here Comes the Bride,” Popeye heads west for a vacation. His R & R is interrupted by an Indian tribe who want to have the sailor for dinner…literally! He’s saved the chief’s daughter, but he may have gotten out of the frying pan only to wind up in the fire! Olive Oyl to the rescue? In “Rolling Along,” Sherman is disappointed in his financial situation, so he makes his one dollar bill to appear as if he has a wad of bills. His sudden “increase of cash” leads to some funny situations. These books are fun to read. Sure the stories are a little on the crazy or absurd side, but it doesn’t make them any less enjoyable. With most comics being serious, dark, or whatever, it’s nice to take a break and read something a little more light in tone. This book is great for all ages and worth picking up! CLASSIC POPEYE #20 is in stores now, or available for ordering at www.idwpublishing.com or www.yoebooks.com.